Shaker Style Spindle Pincushion - This was made from an actual Shaker piece I have in my collection. Designed to be decorative or used as it once was to hold needles, pins & spools of threads. Both kits and finished ones have aged wooden spools with brightly colored flosses wound. A great way to utilize your favorite vintage scrap of cloth on the pincushion - fabric is included with all other materials but you might prefer your own. 6-1/2" tall. A doll sewing caddy/pincushion taken from antique ones (the concept), a cookie cutter woman I love from an antique collection (the outline) and antique paper doll styles of the late 1800's (the underwear look). Body outlines, hair and face designs are silkscreened on to body fabric, but you can use the paper patterns included to make more dolls. There is not much machine work as most of the doll is finished by hand. Her arms will be drawn and sewn from the arm pattern and her skirt is stuffed to become part of her whole figure. The apron, which has a pocket for small scissors, and her bodice are appliqued on. The needle keeper (shaped like an old-fashioned pocket once worn around the waists to hold various everyday sundries, especially sewing tools); and the strawberry emery hang from her waist. Her broad hips become the pincushion. All of her features and hair are simple and relaxing embroidery. Under everything are wood forms to define her shape and give her standing presence. 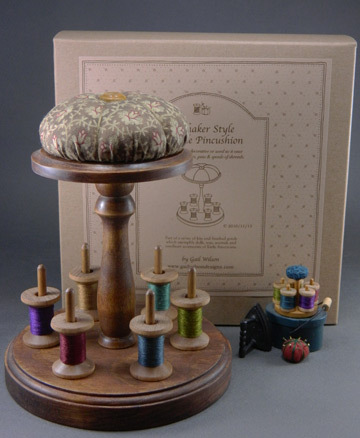 Her oval wooden base has two spool spindles fitted out with old-style wooden spools which you wind with thread for display or you can use the spindles for your own actual sewing threads. If you wish to make more and do not have or wish to purchase the additional wooden parts or silkscreened bodies, you can use the included patterns to make your own. She is intended to be solidly stuffed with wool (the best pincushion stuffing), but you can use wool for upper parts down to below hips and other stuffing for lower skirt. Finished Pincushion Dolls no longer available. FULL KIT - Has all fabrics, wood pieces, silkscreens and supplies. Make this charming pincushion doll using all your own materials. There are supplementary instructions to cover either cutting your own wood pieces or making just the doll part with no base using heavy cardboard. A pattern is given for tracing the embroidery for face and hair. Recommended to use the Basic Doll Body Fabric sold on my Fabrics page - $7.50/yd Add to Cart and the Wool Stuffing sold above. I have always been drawn to hex quilts and my Hitty customers will know I have included hex quilts in Hitty scale for years. Recently I saw some made in canning jar lids, but not content with that because I wanted more color expression that using my older sewing-pincushion top box idea, that would be just my style. So here is a new pincushion kit, really easy to do with nearly all handwork with the hexes supplied in the kit printed on reusable freezer paper. Pincushions are stuffed with wool (also in the kit) and all is over a foundation of a round paper box, included. The kit only has one fabric combination as shown, but to inspire you to see the possibilities to use your own scraps, I made up 6 more for the picture below. Hearts are not only for Valentines but are very collectible at any time - I have a large heart collection of antiques with hearts. This 8" tall (including wooden base) pincushion is made of hand dyed wools in the penny rug style and stuffed with wool roving which allows pins to glide in. This kit is very easy to do and can be made in an evening with relaxing (and addictive) penny rug hand sewing. Everything is included (stuffing too). All you will need is finish for the wood - this is explained in detail in the kit. Decorative scissors are optional (because you may want to store your own best 4" embroidery scissors) but for this sale there is a limited offer for scissors. If you have made others of my Pincushion collection from the past, this one fits in nicely. With so much emphasis on sewing in dollmaking, it is no wonder dollmakers are also attracted to old fashioned sewing accessories made from scraps and materials at hand to protect and hold safe these precious items. I have gathered together a pincushion top sewing box with attached strawberry emery, two needle cases, a flat style tomato pincushion, and a scissors case. Available in pattern only version, limited edition kit and finished as a special gift for yourself or for someone else. Kit has all materials including the papier-mache foundation box, vintage style mixed prints, wool roviing to stuff both pincushions, buttons, and other notions. Finished sets are made up in either reproduction fabrics or vintage fabrics as shown above and include fancy snipping scissors in the 7-piece sets. Limited Edition Kit $48.00 Sorry, not available at this time. Finished Finished Vintage Sewing Sets no longer available. DOLL'S SEWIES FOR ACCESSORIES (scaled for dolls) ~ These items come as a very sweet and fun kit for small dolls or items can be ordered finished. Early American ladies spent much time on their needlework which was often kept in their pockets (a pouch that hung from their waists). This is a set of fancy working miniature brass scissors and a set of patterns for a tiny scissors case, flat tomato pincushion and a strawberry emery. All items are well under an inch and easy to make from your silk (or cotton) scraps. They are nice to hang from doll's apron waist on a silk ribbon. This is the set that the Pattern will make. MY ORIGINAL VINTAGE STYLE PINCUSHIONS - I have always been intrigued by the wonderful and often whimsical pincushions that were created by women long ago. I have taken my own "folk art" liberties in the designs, feeling that it is well within the nature of these pieces. Historically strawberries and birds figure prominently as well as pincushions on pedestal bases - usually these were created from broken and saved glass oil lamp bases in the spirit of making use of everything. I have instead chosen to make my own bases of turned wood treated to look in character. My bird pincushion has the added feature of a spindle for spools of thread. Stuffed with the best fine wool for preserving needles and pins. SORRY ALL 5 OF THE ORIGINAL PINCUSHION KITS AND FINISHED VERSIONS PLUS THE MINI STRAWBERRY ARE NOW SOLD OUT AND DISCONTINUED. Kits to make these pincushions contain all the velvets (or other fabrics needed) and wood parts, real wool stuffing and notions to make them. All you will need is finish for the wood - this is explained in detail in the kit. This is just like the larger one above, even with its own turned wood base, but is only 2" tall. Just right for gifts or for a doll. Comes in tidy little brown gift box.